Health Food Extravaganza at Dean’s Market, New Jersey! 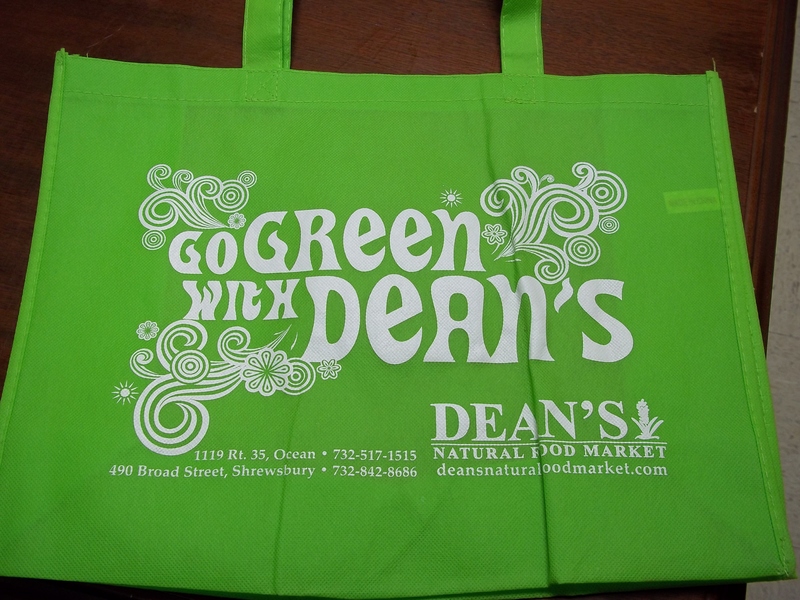 “Go Green With Dean’s” bag – free to every customer today! I set the alarm early on a Sunday for a 40 minute drive to the Shrewsbury location off Exit 109, from my home town Exit of 138. My husband, who is slowly but surely getting into the healthy lifestyle was also excited to accompany me. Each customer who came to the store today received a green bag (while supplies lasted) to fill up with goodies. Whatever a customer could fit into the bag, was automatically given a 20 percent discount. And each customer was given a swag bag full of goodies, such as fruit flavored Omega 3 samples from Barlean’s, organic shampoo, vegan cookies, Kind Bars, natural chewing gum, recipe booklets from Eden products, raw vegan protein packs, etc. Free food sample demos were also held throughout the store. I was able to sample yogurt covered goji berries, hummus and crackers, raw vegan chocolate drink, and coconut water. I received another free Dean’s bag (and brought more goodies) and another free swag bag of samples. Now, what I love about Dean’s that sets them apart from other health food stores is that they make a lot of their own food. They have a raw vegan cream cheese that is to die for! They are also on the up and up in regard to gourmet raw food products that Whole Foods and other health food stores have yet to tap into. For the past few years, I’ve been making special trips to Dean’s so I could purchase products from Awesome Foods (http://awesomefoods.com/). They also always have sales on my favorite drink, GT’s Kombucha (http://www.synergydrinks.com/). And lots of products from Sunfood (http://www.sunfood.com/). Sunfood makes the most amazing raw coconut wraps! Restaurants, please take note and get a little creative! Please use these wraps in dishes! They are so healthy for you! Now, aside from all the gourmet healthy goodies, Dean’s has the biggest selection of organic produce, featuring stuff you just can’t find anywhere else. It’s the only store in New Jersey I can find organic kumquats! Hey, maybe someday they’ll have organic durians too! One can only hope! And I’m happy to report prices are always reasonable. There is always someone in the store to help answer your questions. One time I couldn’t find an item and three workers directed me to the right area. Now that’s fast service! Well, it’s nice to end the weekend on a natural health high. Thank you Dean’s. I’ll be back again, real soon!